A couple snowstorms ago, a grocery-shopping spree was timed before the arrival of the first of trillions of snowflakes. In a fury of quickness, a few sweet potatoes were picked up along with the Southern propensity to buy excessive quantities of milk and eggs before a storm. Over time and periods of warmness that melted the snow, other ingredients for delicious recipes were consumed. The sweet potatoes sat still in darkness. It’s not as if they weren’t wanted or a bore, for they were the favorite taste among all the ingredients. One day, a father released a new recipe to the email winds of change. It was a simple cake calling for sweet potatoes. Quite easy the recipe read to be. The supporting ingredients, good for their purpose, tried to be difficult to the process of baking a cake. The juicer could only fit the size of lemons and limes. An easy decision of exclusion was made, and fresh juice was hand squeezed from the oranges. Although, feelings of grief swelled as excess flesh was wasted. The brown sugar hardened to a rock, refused to change its composition for the good of the recipe. It was placed in the microwave, and it took a few minutes to soften it up. Once it was soften it was place aside to prep other ingredients. However, the brown sugar would not go down without a mean fight. Once cooled, it hardened back into a rock star state of mind. The microwave method worked again, and it was quickly placed in the mixer bowl with the butter to be creamed. The mixer was turned on for the initial step towards making the cake. A couple minutes later, it was learned the brown sugar, hot from the microwave, had melted the butter, destroying the creaming step that is necessary to baking a delicious cake. An important decision had to be made. Continue or start over in making the cake for another day. The pan was buttered and lined with parchment paper. The dry ingredients were pre-measured and shifted. Eggs sat in a bowl, happy to be at room temperature. It was decided that the making of the cake must continue. It would be ridiculous if the process should start over. The eggs, flavorings, and the flour mixture were added to the liquid sweetened butter. Finally, the sweet potatoes, beautifully roasted and pureed, were added to the batter. Alas, at the last minute, it was discovered the orange flavoring was found to be lacking. The sweet flesh that was thought to be of waste was suddenly needed. Quickly, scooping up pieces of the orange, the zest was mixed into the sweet potato batter. 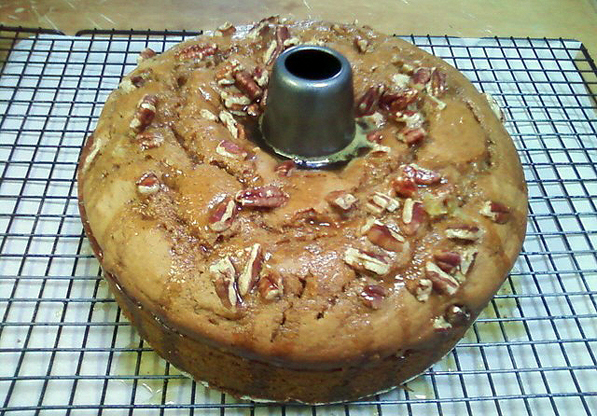 It was poured into the prepared cake pan. Chopped pecans were sprinkled on top. Despite the mishaps, high hopes for eating delicious cake slices tasting of sweet potatoes and orange, were made. To sudden horrors, it was discovered the pan lacked a flour coating as the recipe had directed. Taking a chance, it was placed in the oven in the midst of fears and hope. One hour later, the oven door was opened. Swirls of cinnamon, nutmeg, oranges and sweet potatoes danced in the air. It was tested for completeness. An orange glaze drizzled across the nutty flavored top. Time was needed to allow cooling. With bated breath, an orange colored slice of cake did indeed reveal the taste of sweet potatoes. The buttery, moist texture was attributed to the melted butter caused by the anger of hot brown sugar refusing change. Tasting the Sweet Potato Orange Cake proved it was worth fighting the difficulties. Get the recipe at My Life Runs on Food.